The Land Degradation Surveillance Framework was developed as a response to the lack of methods for systematic landscape-level assessment of soil and ecosystem health. 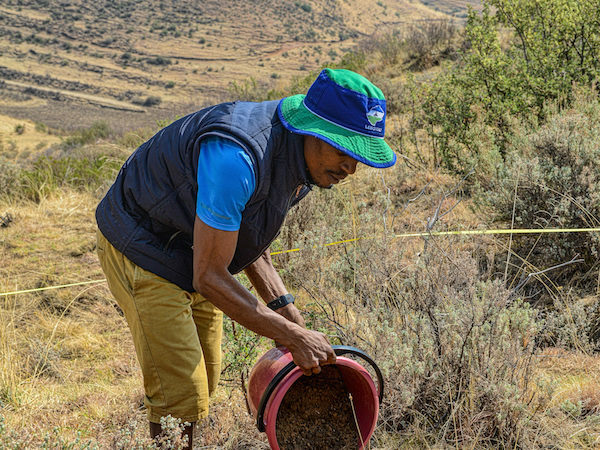 The methodology is designed to provide a biophysical baseline at landscape level, and a monitoring and evaluation framework for assessing processes of land degradation and the effectiveness of rehabilitation measures (recovery) over time. The framework is built around a hierarchical field survey and sampling protocol using sites that are 100 km2 (10 x 10 km). LDSF sites may be selected at random across a region or watershed, or they may represent areas of planned activities (interventions) or special interest. Within each site, 16 tiles (2.5 x 2.5 km in size) are created and random centroid locations for clusters within each tile are generated. Each cluster consists of 10 plots, with randomized centre-point locations falling within a 1 km2 area. Thus, the LDSF has two (or in some cases three) levels of randomization, which minimize local biases that may arise from convenience sampling. Each plot is 0.1 ha and consists of 4 subplots, 0.01 ha in size. Finally, the LDSF has a strong analytical framework built into it for modelling and mapping of a range of indicators of ecosystem health (see examples below). The main LDSF database is hosted at the World Agroforestry Centre (ICRAF) and integrates information from field surveys, laboratory analysis (including NIR and MIR spectroscopy) and remote sensing. Mapping outputs are produced at multiple spatial scales, with fine-resolution maps produced at 5m or higher resolution, high resolution maps at 30m and moderate resolution maps at 250m to 500m resolution.